By LUDWIG VON KOOPA - Allegedly kills Neil Marshall. We'll keep you updated as to if it's proven or not in his upcoming trial. 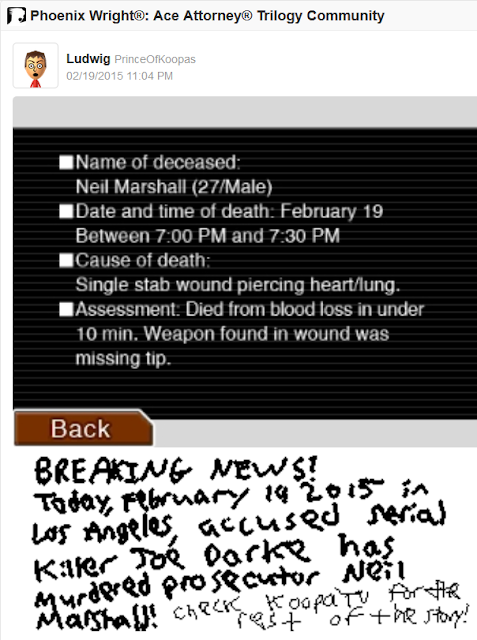 (LOS ANGELES, California) It was a blissful, ordinary day that turned into a dark and stormy night... of murder. Businessman Joe Darke of Darke Flashlights Limited allegedly went on a serial killing spree last September. The Los Angeles Police Department's top talent have been working to nab this guy, and they tell KoopaTV (you're hearing it here first) that Joe Darke turned himself in after months of being on the run for the deaths of Edward Jones, Jason Knight, Edith Kirby, Rachel Moss, and Jeb Bates. We have one more name to add to that list: Los Angeles prosecutor Neil Marshall. Mr. Marshall was supposed to be the prosecutor for the Joe Darke killings, but he is now the (hopefully final) victim. How did this happen?! Deputy Chief of the LAPD Damon Gant gives an almost first-hand recount to KoopaTV on the condition we could not quote him directly. Mr. Gant and Mr. Marshall were interrogating Joe Darke when a sudden power outage occurred. The back-up generators were not working at the time, and since it was nighttime, the solar panels littered across California were of no help either. Amid the confusion, a non-handcuffed Joe Darke somehow escaped the interrogation room and went up a flight of stairs. Neil Marshall chased after him, but Joe Darke made it into the office of Damon Gant and Lana Skye, wielding a switchblade knife he had on him for some reason. Inside the office was Detective Lana Skye's younger sister, Ema Skye. Mr. Gant, although he was not there, surmises that Neil Marshall attempted to rescue Ema Skye from the (allegedly) maniacal Joe Darke. 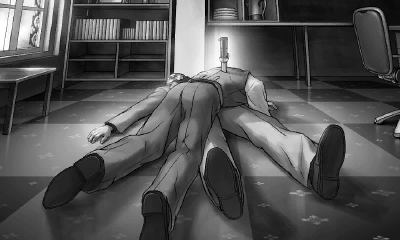 The unconscious bodies of Ema Skye and Joe Darke were found, along with the murdered body of Neil Marshall with the tip of Darke's switchblade knife inside of him. While Neil Marshall was successful in heroically trying to save Ema Skye, he lost his own life in the process. KoopaTV-exclusive photo, provided by the LAPD. Mr. Gant added that Lana Skye was the first one to discover the grisly scene, and she re-arrested the unconscious Joe Darke. 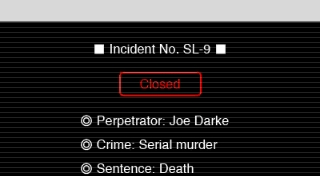 He is now awaiting trial under the new prosecutor assigned to the case, Miles Edgeworth, and Mr. Gant and his group of detectives promise to find the right incriminating evidence to put Joe Darke to justice. KoopaTV is just happy to see this case near a close, so our readers in California can feel relatively safer. We also hope Joe Darke faces justice, lest we have to endure another NO JUSTICE, NO PEACE riot. UPDATE 2/21/2015: Joe Darke's trial happened, and it was not only long but it was also intense. To get it out of the way: Joe Darke was pronounced GUILTY and will be facing the death penalty. He was found GUILTY of one count of serial murder, the murder of Neil Marshall. 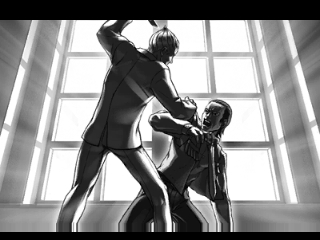 The prosecution, lead by Miles Edgeworth, did not have clear evidence for the murders of the other victims, but threw them in anyway for the serial murder verdict. The results of the trial, referred internally as SL-9. 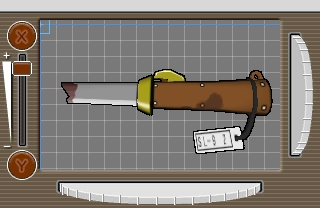 Edgeworth presented the tip of Darke's switchblade knife found inside Neil Marshall. It was a perfect match with the rest of the knife, and tip was planted very deep within Neil Marshall. The knife had Darke's fingerprints on it, and his ownership of it was traced via the store he purchased it in. Darke's lawyer wasn't able to effectively present any other possibility for why the tip of Darke's knife was inside Marshall, and the KoopaTV-exclusive photo proved that there was an altercation between Joe Darke and Neil Marshall. Joe Darke's knife. The rest of it is inside Neil Marshall's wound. Joe Darke about to stab Neil Marshall. Not a real photo. Lana Skye was transfered to the Prosecutor's Office following the trial, and Damon Gant was promoted to LAPD Chief of Police! Congratulations to the two of them, especially Mr. Gant who has been a huge help to KoopaTV! KoopaTV is proud to have a strong working relationship with the LAPD. If you're not a police department, say, you're a game development studio and you would like KoopaTV to cover you, feel free to contact us. Miles Edgeworth himself is now on trial, but he was acquitted after a shocking development that stunned Los Angeles. It turns out that this whole article was fake news, and Joe Darke was NOT Neil Marshall's killer! "Joe Darke about to stab Neil Marshall. Not a real photo." Then what is it? A drawing? "as drew by a courtroom artist:"
""as drew by" Don't you mean drawn?